"The reason they're rising up is they want to be able to go out in public and not live in fear." Students from hundreds of schools across the country began a wave of walkouts Friday morning in a unified voice for tougher gun laws. The protests come on the 19th anniversary of the shooting at Columbine High School, which left 13 people dead in Littleton, Colorado, energized the gun-control debate and became a haunting symbol of gun violence in schools. The students — many not even born when Columbine occurred — represent more than 2,600 schools that were holding moments of silence in honor of the victims as well as the 17 people killed during the Feb. 14 shooting at a high school in Parkland, Florida. The deaths prompted national protests demanding change. On Capitol Hill, students from the Washington area marched while chanting, "Congress do your job!" and "Not one more!" to put pressure on lawmakers who have stalled in enacting gun-safety measures. In Atlanta, students from the area were marching to the state Capitol. "I’m angry," said Ann Philip, a high school sophomore, "but I'm motivated." Fred Guttenberg, whose 14-year-old daughter, Jaime, died during the Parkland massacre, praised the students for walking out, and said all they want is common-sense gun reform that includes background checks and a ban on assault weapons. "The reason they're rising up is they want to be able to go out in public and not live in fear," Guttenberg told MSNBC. The grieving father gained attention in the days after the Parkland shooting by telling Sen. Marco Rubio, R-Fla., that his and President Donald Trump's words following the massacre were "pathetically weak." Yet even as students on Friday headed to rallies at their statehouses or planned to stay at their schools to discuss gun violence, other communities weren't immune from the scourge: Police in Ocala, Florida, reported that one student shot another in the ankle at a local high school. Forest High School was put on lockdown and the injured student was taken to the hospital for treatment. Police said the suspected shooter was also a student at the school. "We have to stop this," Parkland shooting survivor and activist David Hogg said in a video post on Twitter after learning about the shooting in Ocala. "We're not going to be able to stop this unless we make our voice heard … not as Democrats or Republicans, but as Americans." Citywide protests were expected to attract thousands in New York City and Austin, Texas. Police in Richmond, Virginia, say at least 10,000 could gather at the state Capitol. Former Democratic Congresswoman Gabrielle Giffords, who was injured by a gunman in a mass shooting in Tucson, Arizona, in 2011, tweeted her support for the walkouts and rebuked politicians for claiming "never again" after Columbine but "after nearly two decades of inaction, it's clear they’ve failed in their basic duty to keep our kids safe." 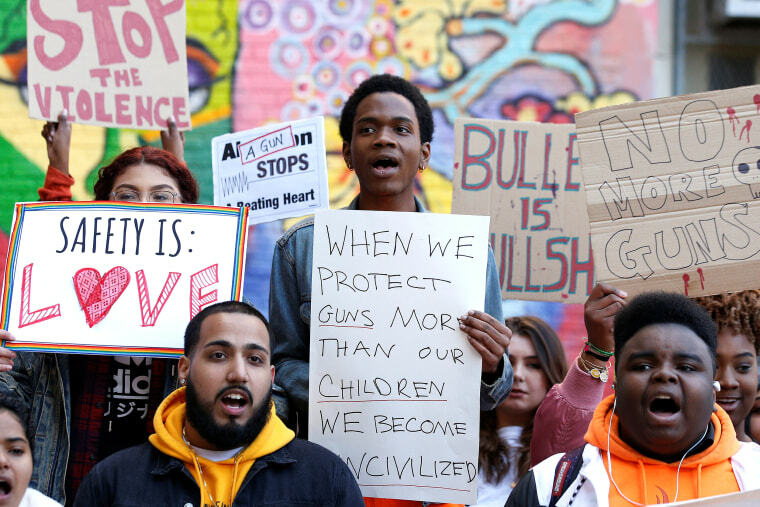 Last month, tens of thousands of students left class to protest gun violence in what historians called the largest youth protest movement since at least the Vietnam War. Days later, hundreds of thousands of teens and their backers rallied across the U.S. calling for tougher laws on guns and ammunition. They also have received help from Indivisible, a left-leaning nonprofit based in Washington that helps boost grassroots activism. The group says it was formed after the 2016 election to oppose the policies promoted by Trump. Even so, students at many New York schools were rallying at the city's Washington Square Park. And some schools in Houston and elsewhere will give students time to share their views but have warned them not to leave campus or return to class late. Some others are holding alternative events after school. Many have simply said students are expected to stay in class throughout the day. Students in the Washington area are planning to march from the White House to the Capitol, where they will rally and deliver letters to Congress calling for greater gun control.